Sorrento is the perfect base for visiting the nearby Amalfi Coast by bus or ferry, with an organized tour, or with a private driver. Sita buses depart from Sorrento directly for Positano and Amalfi all day. The terminal is opposite the Circumvesuviana station in Sorrento and you can purchase your tickets there. The bus stops first in Positano and then in Amalfi. To take the bus further south or visit Ravello, you will have to transfer to a different route in Amalfi. Pros: tickets are quite inexpensive (less than EUR 3) and buses run relatively frequently. If you can get a seat on the right side of the bus, you will be treated to great views along the route. Cons: buses are always crowded and there is not always seating for all passengers, especially if you board along the route. The ride takes over an hour and follows the notoriously curvy coastal road, so is not recommended for those who suffer from motion sickness. This is an excellent option, both convenient and fun! 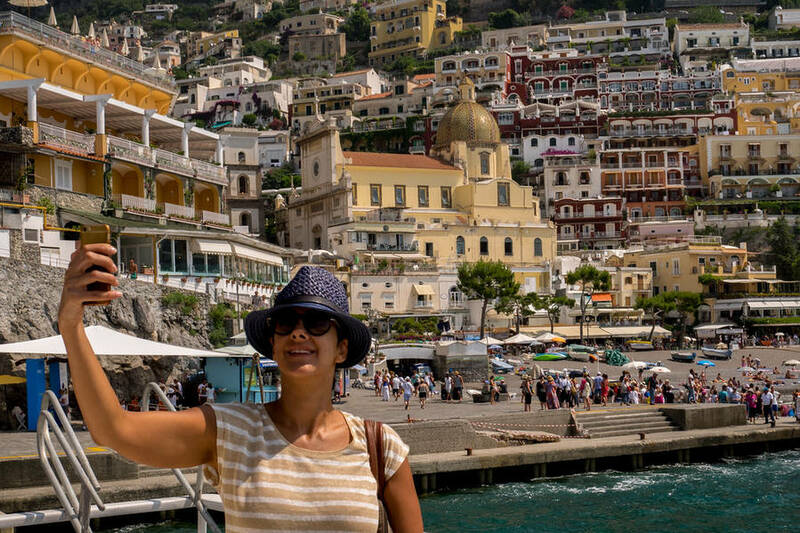 Public ferries from Sorrento to the Amalfi Coast depart from the port and stop at the ports of Positano and Amalfi, both of which are right near the center of town so a convenient starting point to visit these towns. Tickets cost around EUR 15. Tours from Sorrento to the Amalfi Coast depart daily by minibus. From Sorrento, the tour drives along the scenic highway 163 and includes stops in Positano, Amalfi, and Ravello. Stops in each town last about an hour, and a sandwich and beverage for lunch are included. Pros: the opportunity to see the most beautiful towns on the coast in one day, and in comfort. A number of different boat tour companies depart on organized group tours from the Sorrento port, offering mini-cruises to the Amalfi Coast. You can choose between large tour boats or smaller crafts for a maximum of 10-12 passengers. Lunch on board is often included, and almost all tours stop for a bit at Positano and Amalfi to give passengers a chance to explore. You can also hire a private boat, with or without a skipper. There are number of scooter rental agencies in Sorrento which offer rentals for one or more days. We recommend renting a scooter only if you have had a bit of experience driving on two wheels, as the winding and steep roads along the coast are not the best place to learn! Rental costs around EUR 30/day. A car with driver is definitely the most comfortable way to tour the Amalfi Coast, with a customized itinerary and stops along the way.